How can we let this year go by without doing something to recognize the bicentennial year of the birth of Henry David Thoreau? Concord, Mass., the metaphysical heart of all things Thoreau, put together a website http://thoreaubicentennial.org/ with a full calendar of events around the town where the great American thinker lived and wrote, and where he spent the famous retreat in the woods along Walden Pond before discovering the necessity to go back to work in what most of us call, mostly by habit, the “real” world. In the great philosopher and writer’s case, he worked in his father’s pencil factory. My moment with Thoreau came this summer when I picked up a book published two decades ago that featured “Walden” in the title, “Walking Toward Walden” by John Hanson Mitchell. An ambitious intellectual project based on a physical challenge, the book attempted to evoke not only what Thoreau’s neighborhood was like back when he used to take daily walks in the woods outside of Concord, but also what it is like today — along with a fair representation of the Concord region before Europeans arrived in North America and in all the intervening eras since. Nathaniel Hawthorne, who referred to Concord as “Eden,” moved there in 1842, Bronson Alcott in 1848. Louisa May Alcott made the place a setting for “Little Women,” a pioneering publishing success. The poet Ellery Channing dwelled there. Feminist educator Margaret Fuller visited often to help prime the Transcendentalist pump. 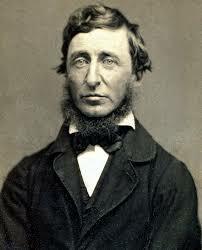 Books about Thoreau are many. 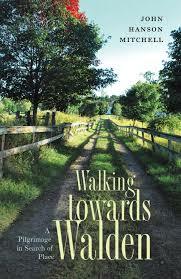 Books about walking his land are rare. When John Hanson Mitchell and his two eccentrically learned friends and traveling companions set out to walk from Westford, Mass. to Concord entirely through undeveloped land — in one day — the literary adventure goes forward but also backwards, with many frequent side trips into the major interests of the three hikers, their previous ventures together, and some references to their separate adventures as well. One of his companions knows everything about birds. The other knows — almost everything — about Native Americans. Mitchell knows Concords backwards and forwards and provides a mean recreation of the Revolution-sparking Battle of Lexington and Concord as well. Their single-day trek through land preserves, near impassable wetlands, over high bridges, through the backyards of new housing developments, and along dirt paths that once served long-gone farmsteads, succeeds in evoking a sense, however speculative, of what walking the land meant for Thoreau. We also learn what our contemporary three-some discover about the much-changed, much varied, and still-changing Concord region’s landscape. But even Thoreau himself was “passing through time” — that’s the way I’ve decided to think about it — when he walked the surrounds of beloved mid-19th century “Transcendentalist” Concord because the changes wrought by the European civilization planted there were already evident. The Colonial farms of an earlier day were being abandoned in Thoreau’s time. Farmlands that had been claimed from the wilderness at great cost — certainly in time and energy — in the 17th and 18th centuries had already been ‘farmed out’ by European methods. Their owners had headed west to find new lands to exploit, and the land left behind was going back (or had already gone back) to the wild. The abandoned fields were still far from the largely undisturbed old forest of the indigenous peoples displaced by the Europeans, but lots of land around Concord was heading in that direction. And in some parts of Mitchell’s journey, the same processes could be observed. In fact, pieces the landscape continue to go back and forth between development and reforestation. The book’s three travelers encounter shopping centers, factories, warehouses, railyards, technology think-tanks and corporate centers along Route 128 (“technology highway”). They pass through suburban subdivisions, protected wildlands with conservation restrictions in perpetuity, dried riverbeds and new wetlands. The beavers that disappeared before Thoreau’s time have now returned. As we know, more clearly than 20 years ago, deer are everywhere today. Just reading words such as these makes me sad to realize that I cannot today leave my door and achieve by foot in any reasonable time frame “the lure of the wild.” I suspect that even on my best days I could not have kept pace with Thoreau’s habitual walks.